In 2017 we road-tripped to Cornwall and wanted a rest stop along the way, and we're always eager to explore new places, so we picked a place on the map and aimed for it. We'd chosen an area in Mid-Devon called Lydford Gorge. It's a part of Devon owned and managed by The National Trust, and on past experiences we've found that The National Trust do an amazing job, so we were pretty sure we'd find somewhere special. What it gave us was more than we could of imagined. The gorge is the deepest river gorge in the South West of the UK with a spectacular 30 metre waterfall called "The White Lady". There is a circular well maintained and sign posted walk around the gorge taking in the woodlands, farmland, river and waterfall. 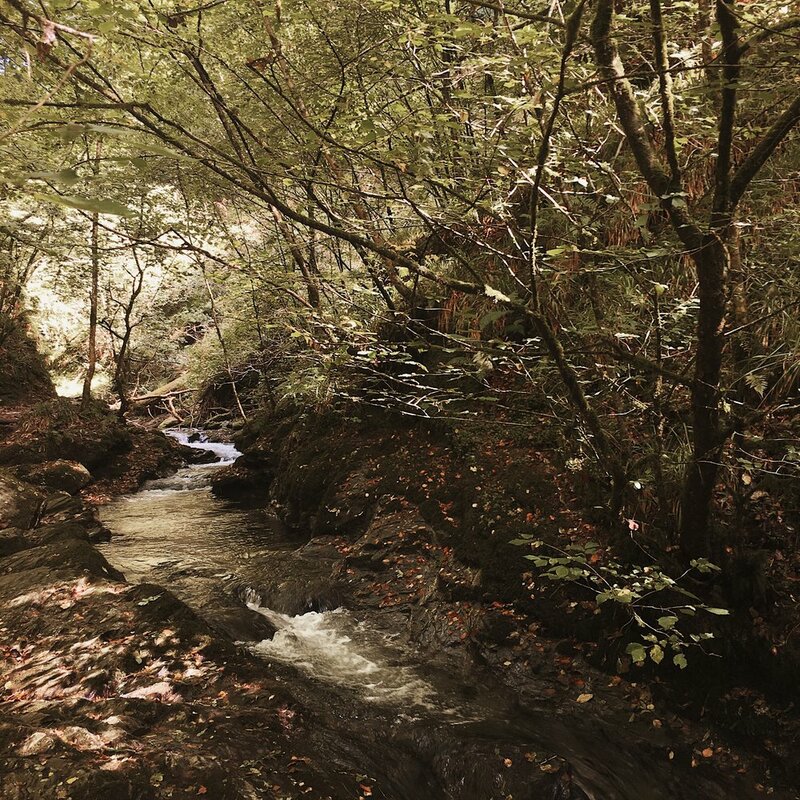 The first half of the walk takes you through the woodland, high above the river and to the top of the waterfall. We were lucky enough to go on a sunny day and enjoyed the golden light falling on us through the leaves. Then you walk down a steep set of steps to the bottom of the fall. You follow the path along the rivers edge, some bits can get slippy here, so be careful, until you climb again to the Devil's Cauldron! This is a swirling pool of water through the cliffs which you can almost climb into. As you drop down to the Cauldron the temperature really drops and as it does the noise level goes up. You can sense nature's fury all around you so the name seems very appropriate! The total walk takes around an hour, but longer if you stop to take photos and have a sniffing dog with you, like we did! It is the perfect hidden retreat deep in the Devonshire countryside. When most people go on a city break they think of open topped bus tours, city skyscapes and boutique shops. Edinburgh is a city like no other. The streets twist and change elevation around the landscape. The castle looks over the city from its vantage point from Castle Rock. One of three volcanic natural structures that make the city the size and shape that it is. Calton Hill and Arthur's Seat are the others. To the east of the city centre near the Scottish Houses of Parliament is Holyrood Park and its lochs and green grassy slopes. It is from Holyrood Park you can start your climb up to the summit of Arthur's Seat. At 250.5 metres high it is the highest of the three volcanic peaks around the capital. The path is well trodden and can be done in normal trainers and clothing. When you begin you are pretty much at sea level and begin to climb quickly. 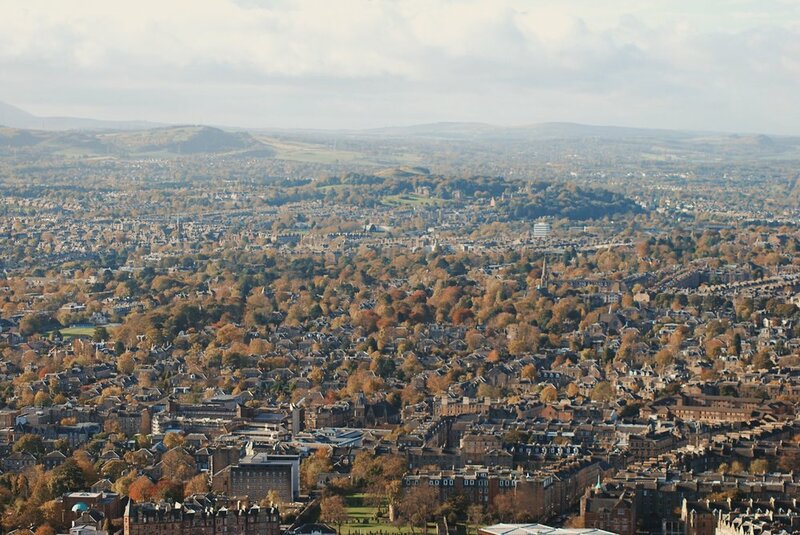 You're soon above the treetops and looking over Edinburgh's rooftops. 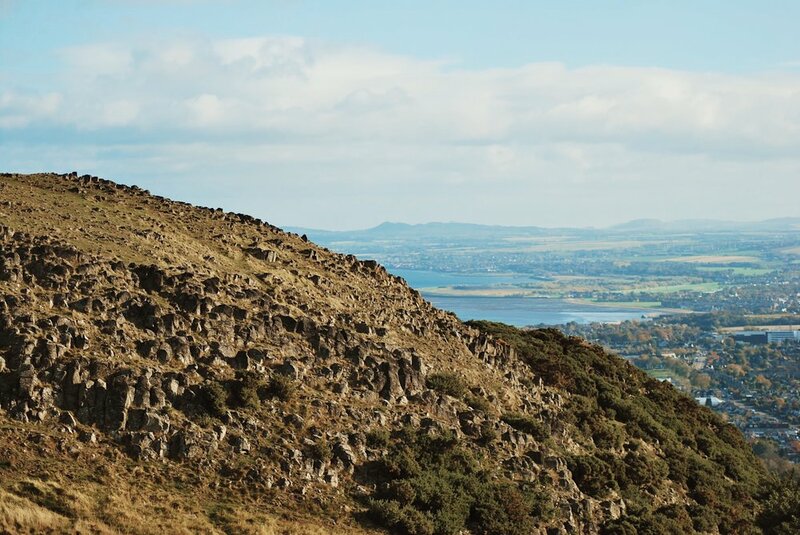 The Castle can be seen across the tiled peaks of the houses and shops and as the path twists around the sides of Arthur's Seat you get views across Mid Lothian and the southern Scottish rolling hills. It isn't clear where the name "Arthur's Seat" came from. Some say it is from Arthurian legend or others say its from the Gaelic "Ard-na-Said" meaning Archer's Seat and over years its been corrupted and has become Arthur's. It certainly would of been a great vantage point for an archer! The path after a while switches to the left and then doubles back on itself before the last climb to the summit. Here the wind can hit you hard and you'll see the North Sea before you as you look down towards the town of Leith and Portobello Beach. The 360° view of southern Scotland is amazing. You can take the path down the other side of the hill and make your way down to Holyrood Park and back into the city. You may have forgotten you were in a capital city! I am from Wilson, NY - A small harbor town on Lake Ontario. I started playing piano at the age of 4 and began performing with my guitar at 14. Both my parents are musicians, so I had a lot of support and encouragement. I’ve been performing and writing ever since! When did you decide you wanted to be a musician? Was it a difficult decision to make? Music has always been the most natural path for me. However managing your career and writing songs are two very different things. I earned a B.S. Business Administration with a concentration in the Music Industry from SUNY Fredonia in 2014 and that gave me a lot of the tools I needed to manage myself. After finding myself stuck in a job that I hated and going through a really intense writers block, I decided to buy the van and take off on the road. The more experiences you have, the more you have to write about! Today, the music industry is an ever changing world and much of it is DIY though the internet. I feel blessed to be starting my career in an age where it possible for me to make the decisions about my career. Being self employed can have its difficulties, but I wouldn’t change a thing. Writing songs is my true passion. My van is a 1987 Ford Coachman named Vance. When we bought him off Craigslist, he had only 58,000 miles. Mechanically there was no work to be done, but ascetically he needed some work. We put in bamboo hardwood floors, new countertops, two 100w solar panels, new curtains, painted the walls white, and added more lights. We have a lot of luxuries in our van such as a full fridge/freezer, a two burner stove, running water, a sitting shower, and toilet. 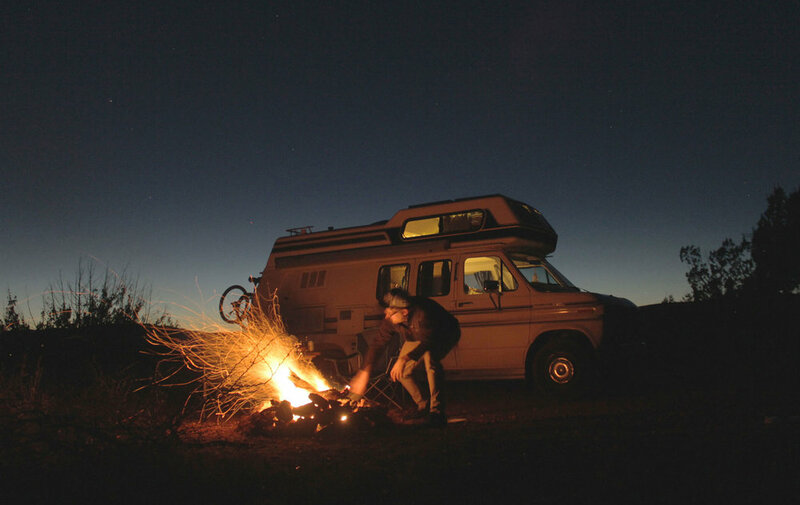 Why did you choose a van to be your home? Does it make your lifestyle easier? As a musician, you are on the road a lot. Touring long term is challenging and hotels are pricy. The more comfortable you are, the more shows you can play. Having a mobile home was the perfect solution. No matter where we are in the country, when we close the van doors, I am home. We practice, write, and create constantly in Vance. Have you found your living space influences your music? We take Vance to a lot of remote desert areas. The desert is a place that has worked its way into my music and my heart. There is something so spiritual about being far away from the civilized world deep in the desert. It would be very hard for me to not be influenced by these experiences. What else influences your songs? My songs are influenced a lot by people. Our time on the road has allowed us to meet some very unique and inspiring people. My last album was made before we bought Vance, so a lot of the songs that will be on my upcoming record tell the stories of these people, as well as what we’ve experienced. Where is the best place you've parked Vance up overnight? We were somewhere in the Tonto National Forest and turned down an unmarked side road. We ended up staying the night on the edge of this huge cliff overlooking the mountains miles into the distance. I just remember how quiet and peaceful it was out there. All alone, miles from any city. What do you do for everyday living? We have a Planet Fitness membership so if we are in a city we will usually go to the gym to get a workout and shower. Otherwise we will use the outdoor shower off the back of our van. We cook almost all of our meals in the van so there is always a lot of dishes being done and constant cleaning. It can be difficult staying tidy in such a small space, but we’ve worked out a good system where everything has a place. I travel with my boyfriend Drew. He is also a singer/songwriter and musician. We were together for 2 years before we decided to move into the van, and we’ve now been together almost 4! It can be tough sharing such a small space with another person, but we do really well! Best gig you've ever done? One of the best gigs I’ve had came out of Coffeyville Kansas. I was hired to perform and/or lecture in 5 high school classes, 10 nursing home/assisted living facilities, and one college class - all in the span of 4 days. As a songwriter it can sometimes feel like you’re not making a difference, but these shows were so fulfilling and engaging. It opened my eyes to the importance of telling your stories and sharing your journey. What does the future hold for you and Vance? We will be heading to Baja Mexico this December. It will be our first time out of the US with Vance. Drew and I both love Mexican culture and paddle boarding on the ocean, so we can’t wait to explore everything Mexico has to offer! We want to extend our gratitude to Savannah for taking the time out of her busy life to speak to us. We loved hearing her story and can't wait to hear yours. If you've got your own Vanlife story then please get in touch by clicking "Contact" at the top of the page. Strap in and venture out! That's the bold message that greets you when clicking on the Arcade Belts website. Never thought i'd get that message from a belt but it's so true. I've been trying out two belt designs over the last few weeks. I've had the Blackwood Adventure belt. With plenty of stretch and with a low profile design it allows you to move freely and climb/hike with comfort. The design stops that awkward belly/buckle meeting point when crouching down which you'd just come to accept, but with this belt that is a problem of the past. The Adventure Belts come in numerous designs and now you can get collaboration designs with skate companies like Santa Cruz. Fantastic quality belts at a good price. Ive also had the Guide Utility Belt, (in Olive Green), and really love how the ratchet buckle allows you to tighten and loosen the clasp so easily when needed. This came in handy when hiking a few weeks ago and taking off base layers once i'd warmed up. The metal buckle is great quality and on both belts the fabric and stitch work is superb. Other designs are available including a woven design and suspenders with some heavy duty clips. Head to the Arcade Website for more information and to see all the products. The belts are imported by Hectic and sold through Blackleaf. Thanks to Samuel Nelson at Hectic Europe for helping with this article. I've been looking forward to sharing this article with you for a while. During the summer we visited so many beautiful places. We drove all over the South West of the U.K visiting coastlines with high cliffs and brutal waves, golden sandy beaches, quaint villages, surf spots, market towns and vast grassy dunes. The very first stop on our travels though was my personal favourite, Cheddar Gorge. More importantly it was Cheddar Gorge's cliff top walk. When we first planned our visit to the Somerset town of Cheddar I knew I wanted to walk the ridge line above the famous gorge. When people think of Britain they think of history and our famous time periods that have not only shaped the U.K but countries around the globe. Cheddar shows a different side of history. A prehistoric history and one that allows you to see how the country was shaped and formed millions of years ago. The oldest British human skeleton was found there in 1903 thought to be around 9000 years old, the subterranean caves show the layers upon layers of limestone which form the Mendip hills around the area and remnants of Upper Late Paleolithic times have been discovered in the gorge. The gorge was formed during the melting winters of the Ice Age where water penetrated the limestone caves and formed the gorge. With grassy slopes to the North and sheer vertical cliffs on the south side its a natural wonder from the top of the bottom. You can easily see it from the bottom as a road winds it way through the cliffs. We took the more challenging option and walked the Cliff Top Walk. The walk begins in the town centre. Make your way to the gorge, which is well sign posted, and look out for the National Trust visitor centre. Between the town centre and the visitor centre you could be forgiven for thinking you'd gone to Blackpool. For me this is the least enjoyable part of the walk. The gift shop and arcades have opened in this part of the Gorge but rest assured that once you pass them you'll soon forget them! Once you find the Visitor Centre take the road opposite and climb quickly. Before you reach the top of the road you need to take the foot path on your right through a wooden gate. This path climbs steeply through firstly a grassy meadow and then woodland. As you're climbing through the woods make sure you keep a look out for the cave on your left hand side. It is worth a detour to this cave. Once at the top of the hill and the edge of the woods you'll find flat grasslands for a while. The path crosses this field and continues on the edge of the gorge. Keeping the wall to your right and continue until you find an obvious path. This area is well inhabited by mountain goats so be aware of them and don't approach them. They've been known to headbutt! The path now winds along the North side of the gorge. The views are not as good from this side unless you deviate from the path. We found a stile which took us down a narrow path to the edge of the cliff. The sides are not as steep on the North side but do be careful if leaving the main path. Continue on this path until it drops down hill. There are steps to make the descent easier. Once at the bottom continue straight ahead, (turning right takes you back along the road), and follow the path through the trees. You'll eventually reach a right turn and the path becomes much wider and takes you to the road. Cross the road and walk into the trees again. 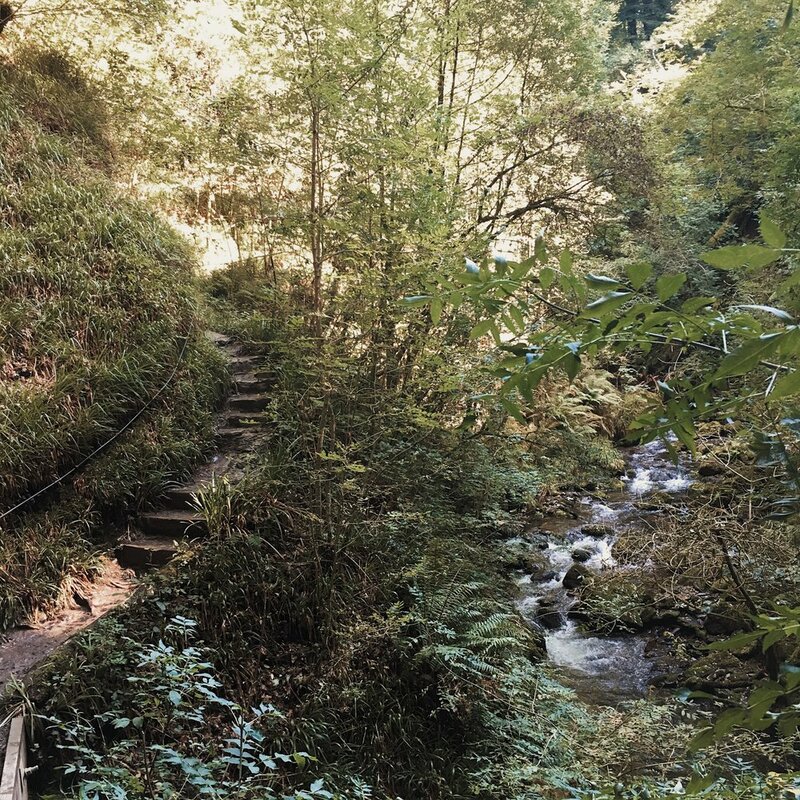 This path takes you up to the South side of the gorge. It climbs very steeply again but unlike the first steep section this path zig-zags up the hill making the climb slightly easier. Once you've reached the top and the ground levels out you follow the well-trodden route through the woods until it opens up in front of you. When the ground opens up you've got two options. Stay left and walk back towards to town or stay right and walk along the very edge of the gorge. Its here that you can really see the incredible power of nature. The ground falls away from you and the next think below you is the road 450ft away! There is no guard rail, no safety signs or warnings. It is how it should be. Natural and raw. A million miles from the amusements at the bottom of the road. We spent around 4 hours walking and around 1 hour of it was spent enjoying the views from the South side. Each new bit of rock jutting its way out of the cliff allows a new vantage point. It becomes an addiction. You can get very close to the edge. As I am demonstrating here! The road twisting its way through the gorge. It isn't until you notice the red car when you realise how high you are! The reservoir is in full view from the South side. Once you've sat and enjoyed the views continue along the path and you start to head downhill. You'll notice the amount of people growing too and that's because you're nearing Jacobs Ladder. A scenic path and set of steps from the road up to a vantage point on top of a viewing platform. When you reach the top of the steps follow them down to the road and back to the start point. Turn left at the road and find somewhere to rest your legs! Once your back in the town centre you can stop and buy some of Somerset's famous Scrumpy cider, we got some Legbenders cider from a shop in the gorge, or you could find a nice pub for a meal. I'd recommend The Bath Arms in the town centre. Muddy boots welcome!